Offa was the most powerful Anglo-Saxon king until Alfred the Great. 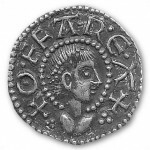 Offa became King of Mercia following the death of his cousin, King Aethelbald, in 757. From his royal capital at Tamworth, he ruled over much of the Midlands, and conquered Kent, Sussex and East Anglia. Offa was often in conflict with the Welsh and fought a battle with them at Hereford in 760. He is best remembered today for the defensive earthen barrier, Offa’s Dyke, which runs along the border between England and Wales.